You are here: Home / Blog / Cosmetic Dentistry / Prevent facial collapse and bone loss with dental implants! Facial collapse might be a serious issue for everyone of us if we don’t take all preventive measure, but, what exactly is facial collapse and what can you do to stop it? 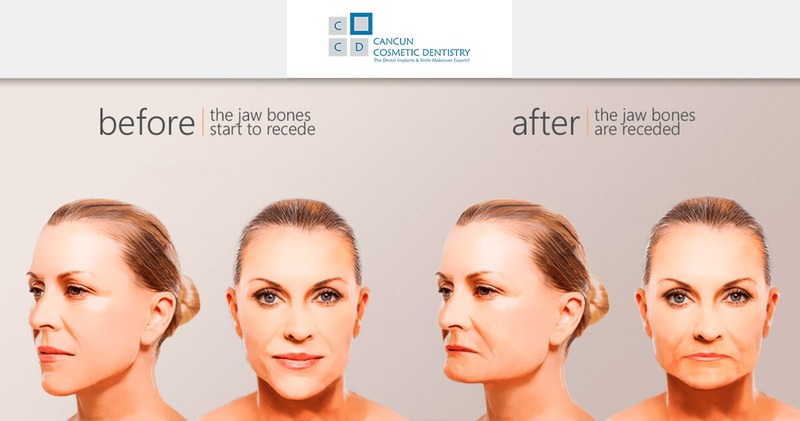 Facial collapse is the continuous process of loosing bone volume on your face and jaw, changing its shape as you age. This is extremely notorious on people who have lost all their teeth several years ago and they take out their dentures. Sadly, many people can’t even use dentures because they are too bulky and the palate might provoke a gag reflex on them. We have have dozens of patients going on with their lives like this and suffering from social anxiety and a lack of a good diet as they can’t eat normal food. What can you do to prevent it? The general consensus on dentistry is that, as long as the bone has stimulation like it used to have when it had the root of the tooth there, the bone will lose volume much slowly. This is why dental implants are the first and best option when one or two teeth are missing. Many people who are currently suffering of edentulism (no teeth left) can also get bone grafts and sinus lifts to provide enough base for the implants to be set. In fact, there are some dental implants techniques that don’t require as much bone, like All-on-4 dental implant protocol by Nobel Biocare and our helpful Snap in Dentures with mini implants. These options provide new fullness to the patient’s mouth and it can even restore the shape of the face in such a way that they look 10 years younger. Cancun Cosmetic Dentistry Review: "Five star service!" The 5 warning signs to go to the dentist! Answers about dental implants, tooth pain, fillings and more! What can you expect after a wisdom tooth extraction? Get a smile makeover and play Golf in Cancun!